This diamond blade has been specifically designed for cutting hard materials such as; Clay Roof Tiles, Ductile Iron, Concrete kerbs, Indian Sandstone and Granite Products. With it's anti-chipping narrow gullet design and soft bond matrix allowing for new diamond grit to be exposed quickly, this disc cuts perfectly every time. 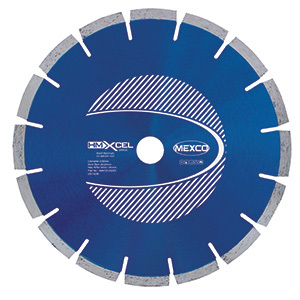 The Mexco XCEL grade uses only the best ingedients available in manufacturing resulting in the best diamond blades on the market today.